Use a light brush and water , mild APC is also fine. Do NOT squeeze or fold the pad, ensure the velcro does not get too wet. 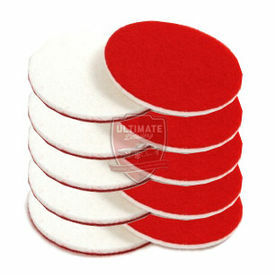 Glass Rayon Polishing Pad - 5" SET OF 5 PADS Features: High Cutting Minimal Heat Stable Glass Cutting pads Hook/Loop backing Made in USA Specifications: Cut: Glass, Minerals, Metals Function: Glass Cutting Pad Material: Rayon Lenzing Fiber Pores Per Inch: N/A Hardness: 1600kpa Diameter: 5 1/8" Thickness: 3/16" Color: White Hook/Loop Color: Red Usage Instructions: Attach to a Dual Action Polisher or Rotary Polisher with a 5" ( or smaller) backing plate Apply a Glass Polish- we suggest our Ceriglass Polish Washing: Use a light brush and water , mild APC is also fine. Do NOT squeeze or fold the pad, ensure the velcro does not get too wet.